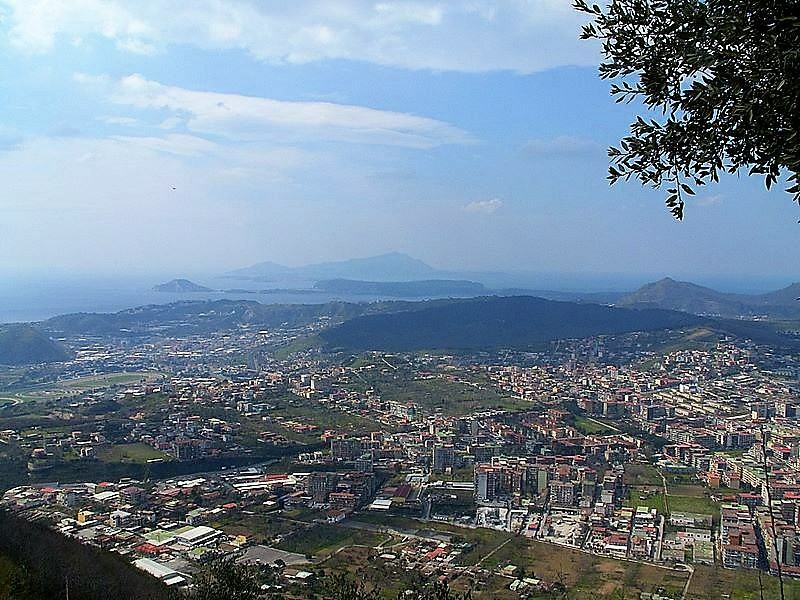 The view is from the premises of the Camaldoli convent to the west over the area known as the Campi Flegrei (The Flegrean - Fiery - Fields).The island of Ischia is in the far background. In front of that is Cape Miseno, the western end of the Gulf of Naples. The Camaldoli hill—where you are standing—(elev. about 500 meters a.s.l.) is of great geological interest. It is what is left of the northeastern rim of the immense Achiflegrean caldera collapse, (alias the Campanian Ignimbrite eruption) of 40,000 years ago, which essentially created the Fiery Fields (everything in the photo between the camera and the island of Ischia in the far background); that is, it created all of the western side of the entire bay of Naples. The bumps and craters in the middle (the Fiery Fields, themselves) are the result of secondary eruptions well after the original caldera collapse. You can stand at the convent and look across the 20 km diameter (!) of the ancient volcano and see what is left of the southwestern rim, the hill above Baia and Cape Miseno (the promontory sticking up at center left), the strip of land in front of the island of Ischia. That strip is the end of the Bay of Pozzuoli and the Gulf of Naples. These are waters where, in Greek mythology, Aeneas' conch-horn player, Misenus, would one day trade choruses with Triton, lose and pay dearly. Consider that the entire distance you are looking across was a single volcanic crater! Do the math. It's a circle. From the convent (the point where the picture was taken, straight across to the other rim, Cape Miseno and the Baia ridge is about 20 km. So the radius is 10 km. The area of a circle is pi (use 3.1416) times the radius2. Big volcano, huh? It certainly was.